Everyone knows that little blue steam engine that kids just love -- Thomas the Tank Engine. 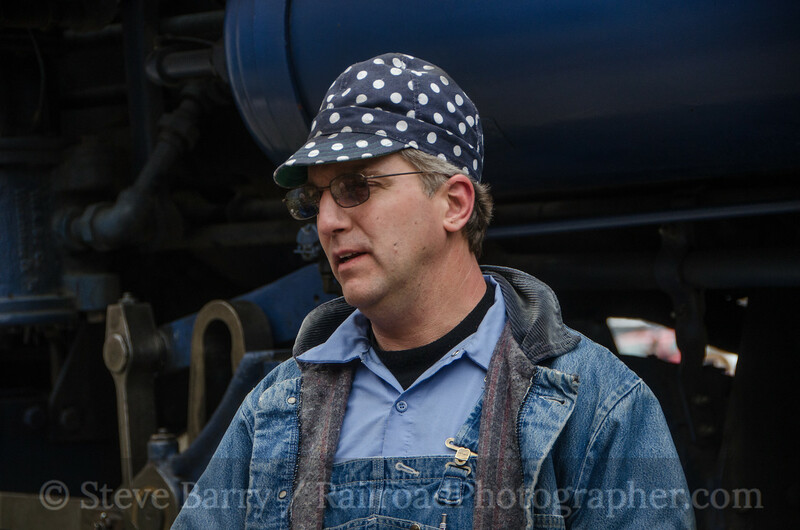 But in the anthracite region of Pennsylvania there's another blue steam engine and it's a beauty. The Reading, Blue Mountain & Northern (which now more commonly refers to itself as simply the Reading & Northern) has had a trim Pacific-type locomotive back in service for a few years now, wearing a blue coat of paint theoretically inspired by the locomotives of the now-gone Reading Company. On November 30, 2014, I chased R&N No. 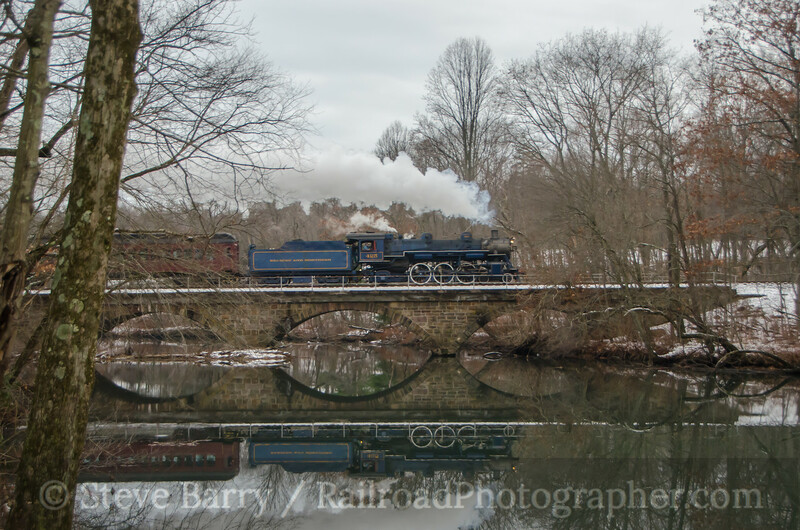 425 (called the "Four-And-A-Quarter") as it pulled Santa trains between Pottsville and Port Clinton, Penn. R&N 425 was built by the Baldwin Locomotive Works in Eddystone, Penn., for the Gulf, Mobile & Northern Railroad, where it wore its 425 number. Retired in 1950, it became part of Paulsen Spence's collection of steam locomotives on his Louisiana Eastern Railroad, where Spence hoped to keep steam power alive as dieselization swept the country. Upon Spence's death in 1961, however, his collection of around three dozen steam locomotives was sold primarily for scrap. No. 425 would be one of only four locomotives to escape the torch. The locomotive soon settled into its new home state of Pennsylvania, working for the Valley Forge Scenic in the 1960s. In the 1970s it briefly went to Delaware on the Wilmington & Western, although it never operated there. In 1983 it returned to Pennsylvania to work on a new tourist operation, the Blue Mountain & Reading based out of Hamburg. When the BM&R purchased a sizable chunk of Conrail's lines in the coal fields, the railroad was renamed to its current Reading, Blue Mountain & Northern. In 1992 No. 425 received a dark blue coat of paint, which was loved by some and hated by some. In 1997, as the Reading & Northern's coal traffic boomed, the steam program was put aside for a decade. In 2007, No. 425 was brought out of storage for a return to service, with test runs late that year and passenger excursions resuming in mid-2008. At this point the locomotive was now wearing a lighter blue coat of paint, the scheme seen in these photos. More work was needed on 425, especially on the running gear to convert it roller bearings. Thus, the locomotive was back in the shop for all of 2011 and 2012. 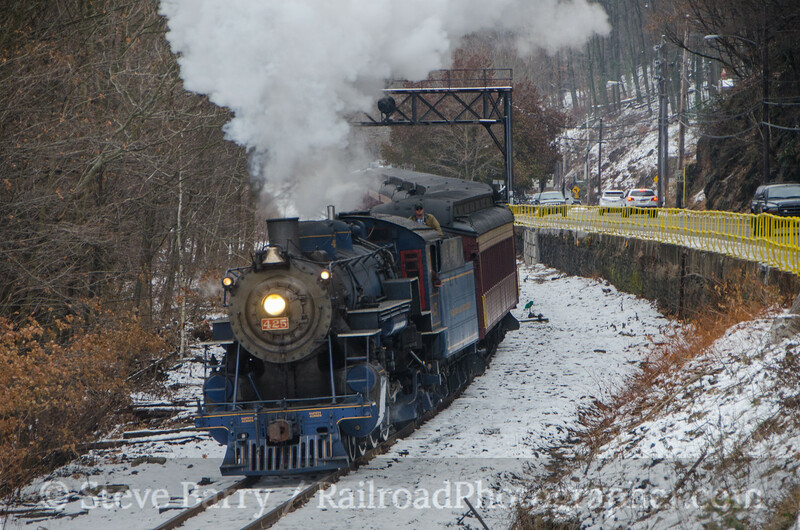 It rolled back out again in late 2013 and has run numerous trips over the Reading & Northern's system as well as on the R&N's regular tourist train operation on the Lehigh Gorge Scenic out of Jim Thorpe. With the winter of 2014-15 here, No. 425 is back in the shop for another round of work. 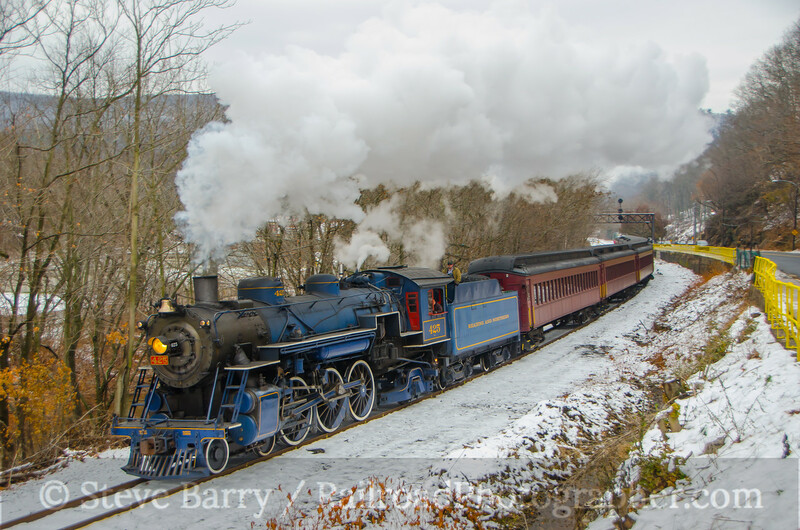 This time, though, rumors abound that she might be finally losing some or all of the blue paint that has made the 4-6-2 so distinctive over the years. On November 30 I went to Pottsville where No. 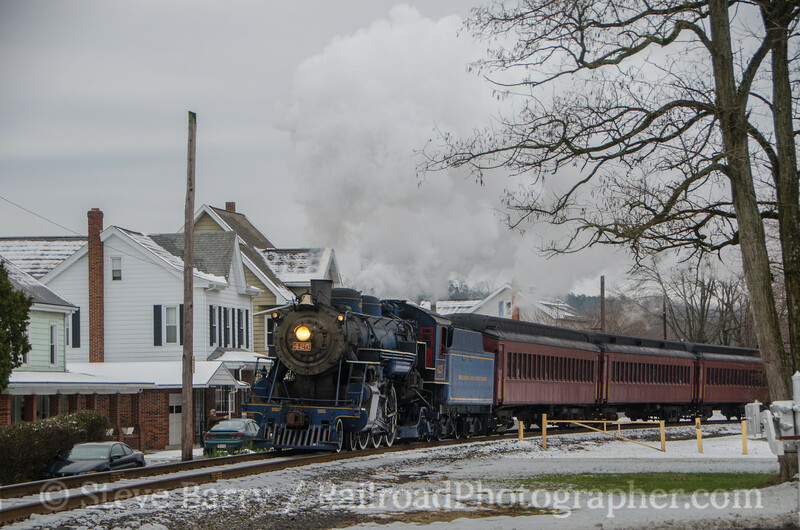 425 was powering Santa trains between there and the R&N's headquarters town of Port Clinton. 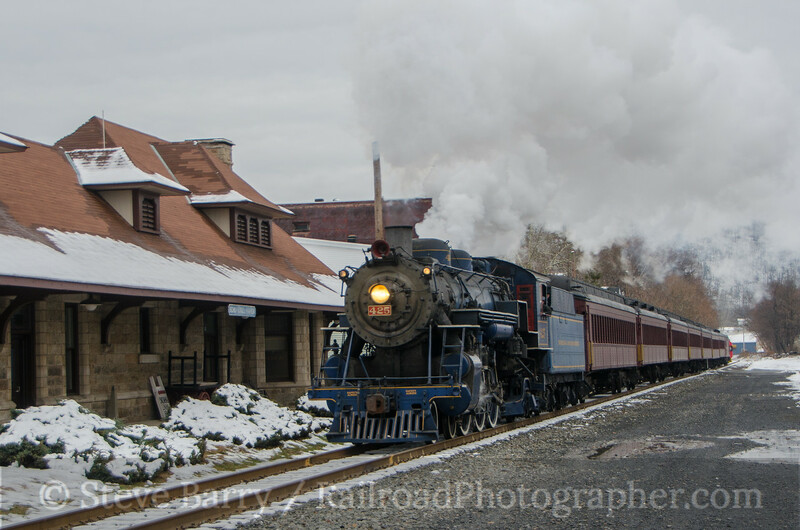 With good track to work with, engineer Chris Bost had the Pacific rolling along nicely on the chilly day. I wanted to get one final look at 425 in blue, just in case the rumors were true. More photos from this day can be found here.